Avant Guarde money for Dudley’s rackets? 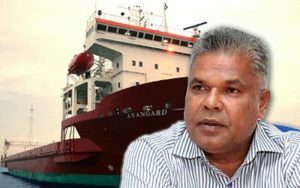 The business circles in the country are buzzing with the suspicion that black money from Avant Guarde has been pumped to broaden the businesses of Dudley Sirisena, the business magnate brother of President Maithripala Sirisena. The dialogue regarding such suspicion came to the limelight when a group including the head of Avant Guarde Nissanka Senadhipathy, Dudley Sirisena, S.B. Dissanayaka , Vajira Abeywardene suddenly met the President. There had been reports that Nissanka Senadhipathy first met the President immediately after Mr Maithripala Sirisena was elected as the President as the common candidate. At the time the President rejected such reports. However, the information regarding the meeting held last week has been confirmed. Meanwhile, the business network of Dudley Sirisena expanding dramatically has made the upper strata of the business community in the country suspicious. The reason for such sudden expansion could be the pumping of Avant Garde black money to his businesses suspect these sections of the business community. Also, Avant Garde racketeer meeting the President, mediation of Dudley Sirisena and the participation of S.B. and Vajira in such meeting when the political arena is getting hot up with election fewer have heightened their suspicion. Jeppos and other Socialists only see Sinhala Danapathiyo. They do not see Indian Parasites. will be with 2 to 3 lakhs only. Whats yours?